Indian mythologies have always seen stories with similar moral told in varied manner; be it the Naagdaman by Shri Krishna, the death of King Harinyakashyap by Narsimha or the killing of Ravana by Lord Ram- all explaining the victory of truth over evil. It is all the more captivating to see a heroic character deceiving his enemy by tactful methods like Lord Krishna in Mahabharata or Lord Vishnu in the incarnation of Mohini misleading the Danavas during the Samundra Manthan. 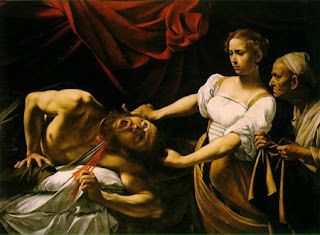 Interestingly a similar connection is seen in a Baroque style painting of Caravaggio called Judith beheading Holofernes. The very comely and rich widow Judith, had put off her mourning clothes, dressed herself in the finest garments and entered the enemy camp in order to rescue her people. The Assyrian army, led by Holofernes, stood in arms before the city of Bethulia. The Jews had lost heart, were on the point of giving up, and yet this woman set out on her own to seduce the enemy. After her bloody deed, the enemy soldiers fled in panic; Israel was saved and Judith returned triumphantly from the libertine’s tent. This characteristic of Judith is similar to that of the Mohini as she distracted the Asuras took the Amrita, and distributed it among the Devas, who drank it. Caravaggio has painted the precise moment in which Holofernes is beheaded. His eyes have yet not grown dim in death, but are staring out of his head, full of mortal fear, and his mouth is wrenched open in a scream. The victim is still alive, his head only half – severed from his body. Caravaggio sought to capture the moment of shock and horror. The King Harinyakashyap got killed by yet another incarnation of Lord Vishnu called the Narsinhma wherein the Lord used his nails to kill him as the King would not be killed by weapons. It was a slow death, with prolonged pain, open eyes filled with horror prominently seen on the countenance. In Caravaggio’s painting, Judith’s features betray neither triumph nor passion, but determination and disgust. 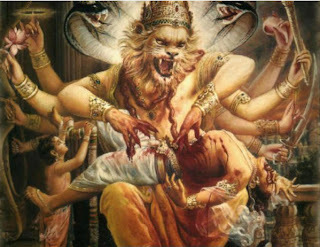 She lays the defenceless man without using force, keeping as great a distance as possible between her victim and herself unlike the Narsimha who puts him on his thighs (neither on earth or sky and kills him. Swords, daggers and knives may be seen in almost all Caravaggio’s paintings. Like blood and decapitation, they constitute a kind of sadistic approach in his work. The paintings of Caravaggio expressed a natural vision. Nor does this demure heroine appear in a magnificent Baroque gown, but in the best clothes of the woman of the people. In doing so, he suppressed neither the furrows nor lines on a face nor the wrinkle produced by a life of toil on the hands of an old woman. It was just “too natural “as said by an artist namely Annibale Carracci could say about his contemporary’s painting of Judith. Figures, accentuated by artificial, almost subterranean lighting effects, standing out against a dark, nocturnal background became a characteristic of his work.